Over the years, most of the common small shark species have come my way. 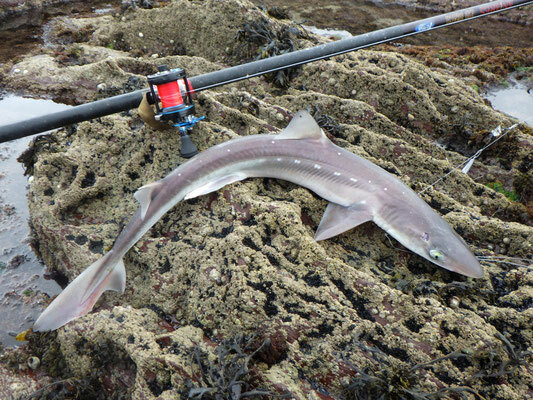 I've caught loads of lesser spotted dogfish of course, and recently plenty of bull huss here in Ireland. In another life back on the south coast of England I caught literally hundreds of smooth-hounds of both species up to about 18lbs; and amid a lot of blank sessions trying, ten tope from the shore including fish of 43lbs and 45lbs. 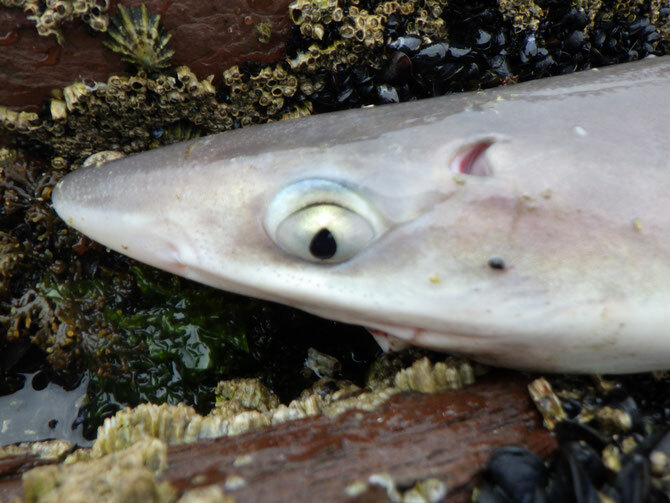 One fish that has eluded me has been the spurdog - mostly I've just never fished in areas where they are ever caught from the shore. So it has been interesting to see there's a fairly reliable showing of them each spring and not that far away from us either, as recorded in the annual IFI specimen listings. And it was even more interesting when my Facebook friend Patrick posted some photos of some whoppers he and a friend had caught last spring. So armed with some pointers from Patrick, this spring I've been heading north. 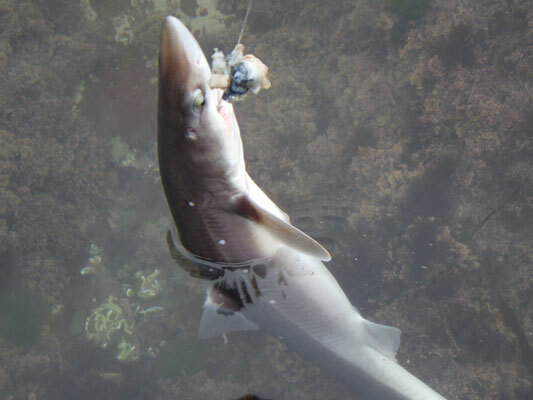 My first trip was at the end of March, and despite perfect-seeming conditions and a perfect tide I blanked save for a couple of dogfish. Unbeknown to me, Patrick was just a bit further along on the rocks, also blanking! 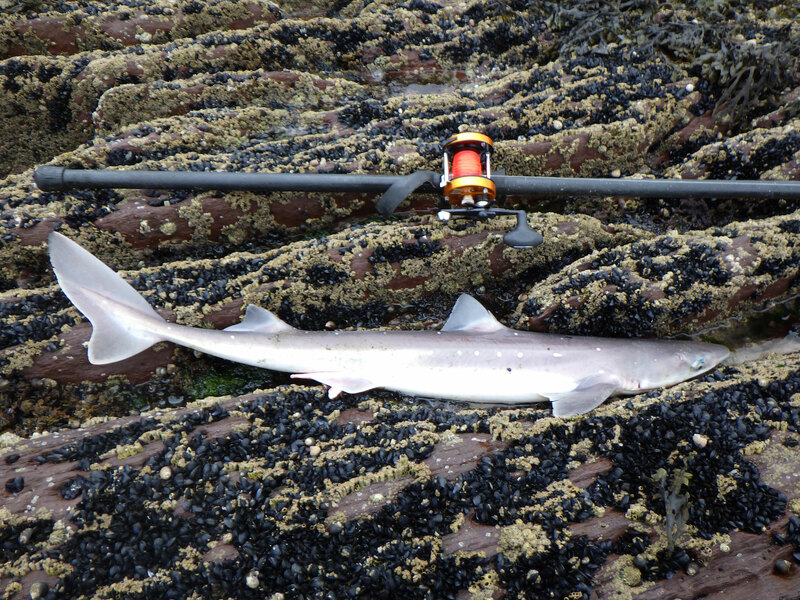 He had one modest size spurdog the next day, but the fishing was generally poor over that set of tides. In fact there had been a better showing over the previous few weeks, instilling an immediate doubt that I may already have missed the best of the fishing this year. Last Thursday, a fortnight later on another good tide, I was back and blanking again. Frustratingly, an east wind had kicked up overnight, probably doing for any hope I had of a spur. Worse, it was forecast to freshen and persist right through the set of tides. Then today, the wind fell light, little more than a nagging breeze. The biggest tides were gone but today's was still a reasonable size. All in all less than ideal, but I decided to give it a go! Fern Collie and I headed for a low water mark, in fact one that has to be evacuated at about half tide (unless you want a very long session) as it gets cut off. We arrived in time to fish the last hour of the ebb, which would give about four hours to fish. The low water period proved very quiet. 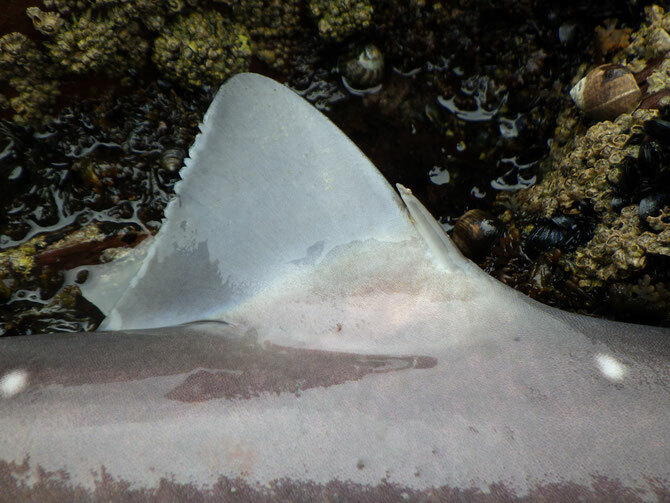 About an hour up the tide, I had a couple of rattling bites that I missed but I thought were probably LSDs. Then a better pull on a mackerel/squid cocktail, and I played in a heavy fish that turned out to be a big huss - abour ten or eleven pounds. Unfortunately it shook out the hook right at the edge. Normally that would be pretty annoying, but as I'd recently caught a bigger one at home, and as I was there for spurs, it didn't seem so bad. About two hours up the tide, with an hour to go, I had a bite on sandeel that I missed. While I was baiting up again I had a bite on mackerel/squid on the other rod. I hooked this one. It felt not very large but a bit livelier than the average LSD. 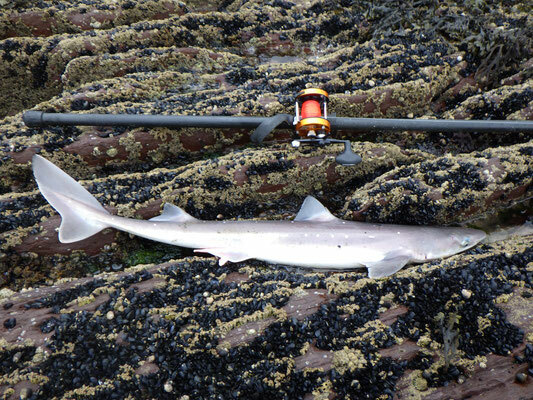 I held my breath as I bumped it through the kelp close in and sure enough it my first spurdog, all 4 - 5lbs of it. Not a monster, but a result! I took some quick pics then got two fresh baits out. Soon both rod tips were going - the sandeel rod pulled over hard so I grabbed that one and wound in another spur. This one zipped around a bit and was a shade bigger, I gave it 5 - 6lbs. The other bait was shredded, but the spurdog had missed the hook. Quick look at the watch - time for a last chuck with both rods. Soon both tips were rattling again. I struck the cocktail rod this time, hooked and landed another spur about 5lbs. This time the sandeel bait was shredded but the spur responsible was gone. It was more than a bit frustrating to have to pack up with the fish feeding well, but it was time to go so I tidied away as quickly as I could then Fern and I legged it before we were committed to another six hours with next to no bait left. I can't wait to get back on the next set of tides and hopefully find some bigger spurs.